Green tea has been consumed for thousands of years, and in the past few decades science has uncovered a number of medicinal uses for this popular herb. Green tea has potent anti-inflammatory properties due to the antioxidants it possesses. It has been researched for its role in treating diseases caused by inflammation, including atherosclerosis, liver disease, inflammatory bowel disease and a variety of cancers. A 2012 cancer prevention research conference presented evidence that men with prostate cancer who consumed green tea before undergoing prostate removal surgery had reduced inflammation markers, the National Cancer Institute notes. The NCI also notes that recent research has revealed that men with a specific precursor to prostate cancer were able to reduce their risk by consuming green tea. University of Maryland Medical Center notes that green tea has shown at least some efficacy in treating a variety of other cancers including prostate, stomach, skin, pancreatic, ovarian, breast, lung, esophageal and colorectal. One of green tea's most potent anti-carcinogenic substances is a polyphenol known as epigallocatechin gallate, or EGCG. This substance may be effective in ridding the body of tumor cells, when used in conjunction with chemotherapy or radiation. A study published in "Lasers in Surgery and Medicine" in 2011 found that EGCG's anti-inflammatory properties increased cancer cell death in breast cancer cells. Atherosclerosis is an inflammatory disease that can lead to stroke and heart disease. A study published in "Annual Review of Pathology" in 2006 notes that inflammatory markers are used to monitor the progression of atherosclerosis and that anti-inflammatory therapies can be used effectively combat the disease. Green tea can help prevent atherosclerosis and coronary artery disease through its antioxidant properties, which help lower cholesterol and triglyceride levels. University of Maryland Medical Center notes that drinking 3 cups of green tea per day may decrease the risk of heart attack -- a disease caused by atherosclerosis -- by 11 percent. 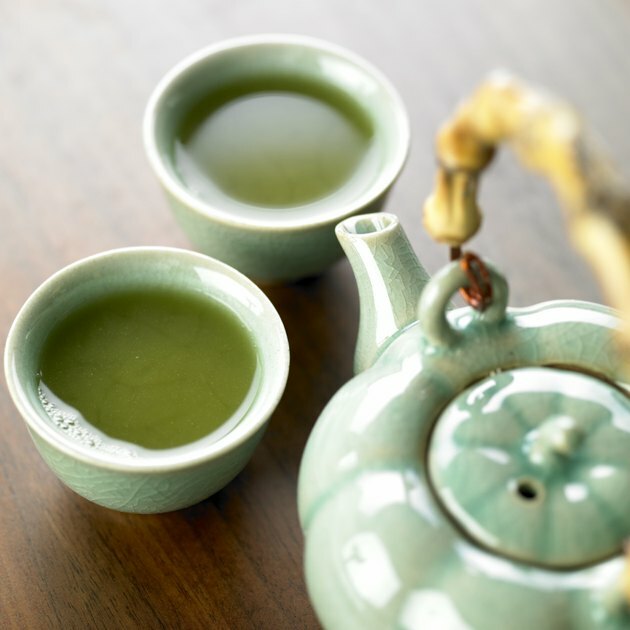 A study published in 2011 in "Cancer Epidemiology" recorded the effects of green tea consumption, with regard to inflammation, in Chinese individuals affected with hepatocellular carcinoma, or HCC -- the most common form of liver cancer. The study found that those who drank green tea for more than 30 years were at the lowest risk for HCC, compared with those who did not drink green tea. The study concluded that green tea could play a role in preventing HCC, particularly in those with increased risk factors, such as alcohol drinking, smoking or hepatitis. According to a study published in "Cardiovascular and Hematological Disorders Drug Targets" in 2007, the polyphenols in green tea contain anti-inflammatory and antioxidant agents that may provide cardiovascular protection. The study notes that EGCG is the most potent and active constituent of green tea and may protect against cellular damage by stopping free radicals from stealing electrons from fat tissues and blocking the overproduction of pro-inflammatory substances.